The past few weeks Custellence has undergone a major overhaul and on Monday the 11th of December we are happy to launch several updates to the app. 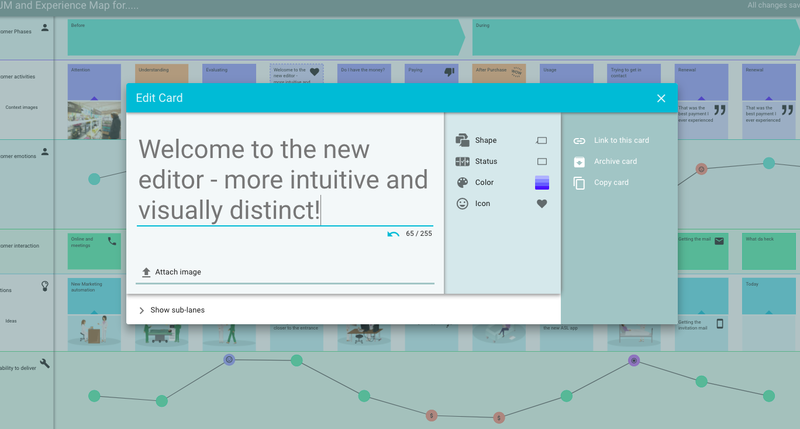 A totally redesigned and more intuitive editor. Easier to work with and visually more distinct when presenting. The trash bin is now converted to an archive, easy to find under the archive menu. Good to know is that the archive is a part of the map and not personal. 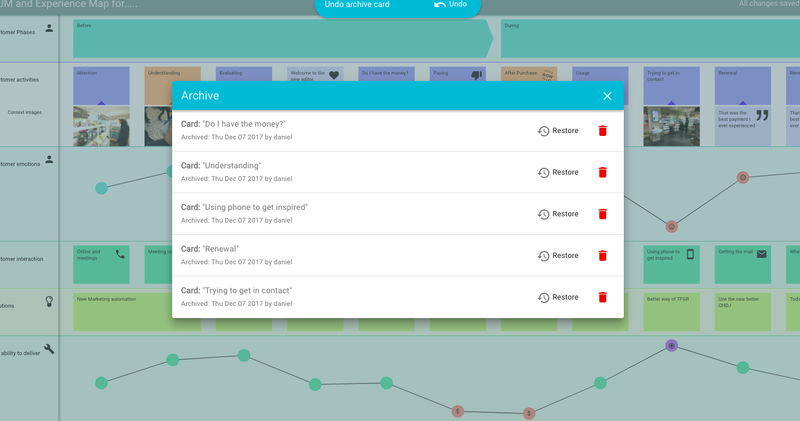 When you archive items you will immediately be able to undo your action if you change your mind. The map is now even more flexible and supports a wider range of situations. More than 100 new icons have been added. Specially designed and chosen to meet your needs as Customer Experience Professionals, e.g. new faces expressing emotions. Sub-lanes can now be created directly in the map, keeping the possibility to create them in the card. Mixed Sub-lanes content - optimizing the space and make more compact maps. The lane colours are now separated from the categories. It’s also possible to choose colours on specific cards and bullets in a curve. This is great for highlighting a card and dots in a curve lane. Link to lane and card editors is a new feature. Working with links are super powerful when collaborating and creating a customer experience ecosystem by integrating with e.g. process-, marketing automation- or CRM tools. Easier to send invites, share a map and manage authorities. All in all Custellence has become even more versatile while staying true to its original purpose - Being the best tool for the Customer Experience Professional. Keep on creating brilliant customer experiences!